Ice dams can be a persistent problem in regions with significant snow accumulations during extended periods of below-freezing temperatures. Ice dams form when roof areas become warm enough to melt snow, typically because of the combination of the insulating effect of heavy snow accumulation and heat loss from conditioned spaces. Water from melted snow runs down the roof under the snow cover and refreezes along roof overhangs where the roof surface temperature is lower. As more water from the melting snow becomes trapped behind the dam of ice, it can back up under shingles and infiltrate the underlayment, leading to leaks. 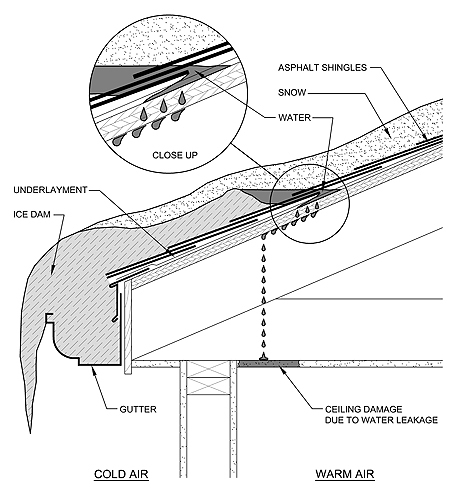 Melting snow that produces ice dams can be controlled if a roof surface temperature is maintained below freezing. To this end, NRCA recommends minimizing the amount of heat reaching the underside of the roof deck by adding a continuous ceiling air barrier or alternatively sealing interruptions in the ceiling vapor retarder with air-impermeable materials such as closed-cell spray polyurethane foam. Secondly, a balanced attic ventilation system will help remove stray heat so temperatures throughout a roof deck are maintained close to the outside temperature. In areas with a history of ice dam formation, vent opening area and ventilation space height (in cathedral ceilings) should be appropriately sized to establish uniform rising air flow, which will cool a roof deck to below freezing when outside temperatures are below freezing. Guidelines for designing cathedral ceiling ventilation to prevent ice dam formation have been developed by researchers working at the Cold Regions Research Engineering Laboratory (CRREL) of the U.S. Army Corps of Engineers and are available by clicking here. Measures that prevent stray interior heat from reaching a roof deck may not always be sufficient to prevent ice dam formation. Sometimes, ice dams occur even when attics are correctly insulated and ventilated because of solar heat and variation in snow cover thickness. A watertight barrier of self-adhering membrane underlayment or layers of underlayment felt cemented together with asphalt bitumen may be applied to a roof deck along the eaves as protection against ice dam leaks. 2012 IRC requires the installation of a water and ice dam protection membrane in place of typical underlayment along the eaves as part of asphalt shingle, metal shingle, slate, and wood shake and shingle roof systems in areas with a history of ice dam formation. The code requires the ice dam protection membrane extend at least 24 inches past the exterior wall line of a building. NRCA recommends installation of water and ice dam protection membrane in locations where the average temperature for January is 30 F or less. The drawing below illustrates the approximate areas in the 48 contiguous United States. Figure: Areas of the U.S. with an average January temperature below 30 F, composite of 1983-2007 data. Map is based on data provided by the NOAA/ESRL Physical Sciences Division, Boulder, Colo., from www.cdc.noaa.gov/USclimate/USclimdivs.html. Contours represent U.S. climate divisions. NRCA recommends water and ice dam protection membrane extends at least 24 inches past the exterior wall line of a building when installed on roof slopes of 4:12 and higher. For slopes less than 4:12 and in heavy snowfall regions, NRCA recommends water and ice dam protection membrane extends at least 36 inches past the exterior wall line. Where ice damming presents an urgent problem and demands immediate action, it may be advisable to remove the snow accumulated on the roof and to prevent additional water backups. Snow removal from a rooftop should be attempted only if it can be done safely from the ground level. An extended-handle broom or roof rake specifically designed for snow removal from sloped roofs may be used to pull snow down and off a roof. This action may damage the roof and should be performed with care to avoid hitting the roof surface, dislodging roof covering materials or pushing snow up the roof. NRCA advises against attempting to break up ice buildups on roofs by chipping away with shovels, picks, etc., or applying high-pressure, high-temperature water. The impact of sharp or hard tools or thermal shock is likely to damage a roof covering and aggravate any existing issues from ice damming. Why choose an NRCA contractor?